Verasonics has developed revolutionary ultrasound system technology based on real-time software. The system accelerates research, provides unsurpassed control while simplifying data collection and analysis process. Advanced OEM Solutions (AOS) designs and manufactures customizable Ultrasonic Phased Array and conventional Ultrasonic instruments perfect for research and industrial applications. Apex Ultrasound company is one of the leading companies for designing, developing and manufacturing medical ultrasonic transducer and probe products and providing interrelated technical service. Cephasonics - Embedded-ultrasound technology and subsystem electronics for B2B health care and industrial applications as well as cutting-edge research can be simply stated: We enable ultrasound. Electronics & Innovation is a focused and dynamic company fulfilling the market demand for rugged and reliable RF power amplifiers, components and modules. We offer unparalleled service and support with custom designs to meet your specific applications. Exelis Acoustic Systems is one of North America's largest manufacturer of piezoceramic materials including components, value added sub-assemblies and transducers for diverse medical imaging, therapy and surgical applications, power ultrasonics for cleaning and welding, oceanographic and oil and gas applications. Exelis has over 60 years of piezomaterials and transducer engineering, design and production experience that has benefitted large and small customers. Exelis offers standard and custom piezoceramic formulations of PZT, PT and PMN-PT materials, FEA and applications assistance for prototype and production volume applications. Exelis is ISO 9001/2008 registered and can provide 100% testing of components. Hitachi Cable America Inc. (HCA) is an indirect wholly owned subsidiary of Hitachi Metals, Ltd., a global manufacturer of high-grade metal products with customers in the computer, automotive and aerospace industries. IPPT PAN is a government funded scientific institute conducting research in theoretical and applied mechanics, theory of coupled mechanical and physical fields, theoretical and experimental mechanics of materials and structures, computational methods in mechanics, acoustoelectronics, and ultrasonic medical diagnostics. Lecoeur Electronique company is devoted to non-destructive testing, using ultrasounds. We are capable of building your custom-made equipment and we are able to adapt to your technical and budgetary requests. Polytec is the market leader for non-contact, laser based vibration and velocity measurement instrumentation. Our innovative solutions allow our customers to maintain their own technical leadership across many fields. When it comes to measuring ultrasound in the frequency range 40kHz to 50MHz, Precision Acoustics is regarded world-wide as a leading global supplier of products to measure acoustic pressure and intensity. Precision Acoustics offers consultancy, for transducer development and acoustic measurement services to medical, NDT and academic establishments. Roth & Rau AG Microsytems provides leading solutions for surface trimming as well as advanced deposition technologies using specialized plasma and ion beam expertise. The equipment and technologies produced by Roth & Rau are used in the photovoltaics, semiconductor, optics, battery, automotive and rail industries. scia Systems was launched in 2013 and offers advanced ion beam and plasma technologies for the production of microelectronics and precision optical components. In a unique manner the equipment of scia Systems integrate advanced source technologies with innovative sample movement for localized rate and process control. SIMetris support ultrasonic product development using our finite element simulation tool NACS. We provide analysis of piezoelectric, vibroacoustic, and magneto-mechanical interactions as well as product optimization. Sonic Concepts is the designer, developer and direct marketer of a variety of products which include standard and custom HIFU transducers, custom array transducers, instrumentation, hydrophones and calibration, acoustic lenses, and our transducer design modeling software package, PiezoCAD. S-Sharp is dedicated to providing cutting edge ultrasound solutions to our customers with many years of passion and experiences in ultrasound research and development. The goal of TRS Technologies, Inc. is to utilize cutting edge R&D combined with extensive manufacturing knowledge to build and grow lasting and profitable business relationships making us the preferred supplier of high quality, specialty piezoelectrics and dielectrics to OEMs in the medical, sensor, and military markets. Ultrasonix diagnostic ultrasound systems are designed to make ultrasound easy to use in more areas of patient care. With high-resolution monitors and excellent image quality, our systems are ideal for point-of-care markets and procedure-driven applications. Analogic Ultrasound designs and manufactures ultrasound systems that are sold to medical practitioners under BK and Ultrasonix brands. VTT Technical Research Centre of Finland is a globally networked multitechnological applied research organization. VTT provides high-end technology solutions and innovation services. We enhance our customers' competitiveness, thereby creating prerequisites for society's sustainable development, employment, and wellbeing. Weidlinger Associates is the developer of PZFlex, the premier finite element simulation software for piezoelectric and ultrasound analyses. Specifically written for this class of problems, PZFlex displays efficiencies that allow multi-million element models to be solved rapidly on a desktop PC. For nearly 20 years PZFlex has been the simulation tool of choice of the ultrasound imaging, SONAR, NDT, sensor and actuator communities. 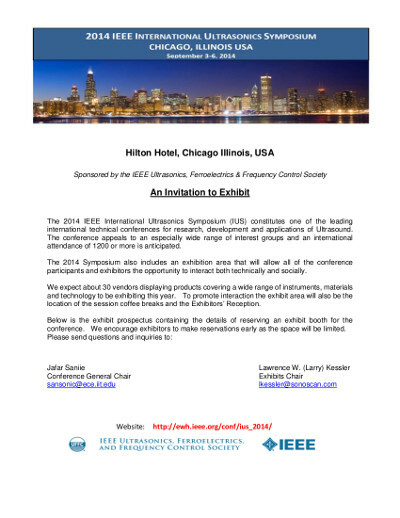 On behalf of the IEEE Ultrasonics, Ferroelectrics and Frequency Control Society, the Organizing Committee for the 2014 IEEE International Ultrasonics Symposium welcomes you to Chicago. The 2014 IEEE International Ultrasonics Symposium (IUS) constitutes one of the leading international technical conferences for research, development and applications of Ultrasounds. The conference appeals to an especially wide range of interest groups and an international attendance of 1200 or more is anticipated, and we would like to invite you to be part of this exciting conference. The 2014 Symposium includes an exhibition area that will allow all of the conference participants and exhibitors the opportunity to interact both technically and socially. To promote interaction, the exhibit area will also be the location of the poster sessions and session coffee breaks. The base exhibit will include a standard 10 by 10 feet booth, equipped with a table, chairs, name tag, and we will make wireless internet accessible. Upon request further installations and furniture is available. Below, you can find the exhibitor application form and the exhibit prospectus containing the details of reserving an exhibit booth for the conference. We encourage exhibitors to make reservations early as the space will be limited.